Home / Blog / Park Passes / Park & museum passes are available for checkout! Park & museum passes are available for checkout! Looking for a new family adventure? All you need is a library card to check out passes for free or reduced admission to great destinations in Georgia. Visit Zoo Atlanta, the Center for Puppetry Arts, The Michael C. Carlos Museum or any of Georgia’s 63 state parks and historic sites. All passes are limited to adult borrowers only. The Go Fish Education Center located in Perry takes visitors on an educational journey through Georgia’s watersheds to learn about our diverse aquatic wildlife, their natural habitats and the impacts of water pollution. Beyond that, the Center serves as a great resource of fishing information for any level of angler – where to go, what to use and when. Our pass provides free admission for up to 4 guests. The Center for Puppetry Arts‘ mission is to touch lives through the art of puppetry. The Center’s live puppetry performances, hands-on workshops, and guided museum tours provide creative arts experiences to students that aren’t available in classrooms while also providing teachers with opportunities to infuse the arts into their curriculum goals. Pass is valid seven days a week. DVD checks out for 7 days, pass is good for 14 days from the date of the receipt showing the return of the dvd. Patrons must first check out an informational DVD. When this is returned, fill out a pass form for the patron and staple the check in receipt to that pass. Zoo passes must be used within 14 days of receipt. Only adult patrons may check out the zoo pass, and only once per year. Spend the day a world away at the Michael C. Carlos Museum. 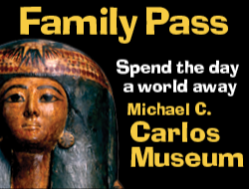 With the Michael C. Carlos Museum pass you can explore collections of Egyptian, Near Eastern, Classical, ancient American, African, and Asian art, as well as its important body of works of art on paper from the Renaissance to the present. Restrictions- The pass is not valid for events, program fees, or audio tours. Explor ers welcome!! With our pass you can spend the day at the Chattahoochee Nature Center and enjoy wildlife, hiking, and gardens. Located in Roswell, Georgia, the CNC with help connect you with environmental education, horticulture, and more! Restrictions – The pass is not valid for special events or activities. The William Breman Jewish Heritage Museum presents Jewish history, culture and art. With the family pass, you can visit the permanent exhibition “Absence of Humanity: The Holocaust Year 1933-1945” presents the history of the Holocaust through artifacts and stories of Atlanta area Holocaust survivors. Our pass provides free admission for up to four guests. Restrictions – The pass is not valid for events, tours, or performances.